If faces and/or license plates are detected, automatic transmission to control centres via secure transmission lines is possible. With conventional video technology, faces in the vehicle can hardly be recognized. Light reflections on the windscreen, unfavourable street lighting, tinted vehicle windows and, last but not least, poor visibility due to bad weather conditions, make recognizing faces of vehicle passengers very difficult. The use of conventional IR illuminators shows no improvement. Speed camera and distance control systems cannot meet the high demands for reliable face recognition. 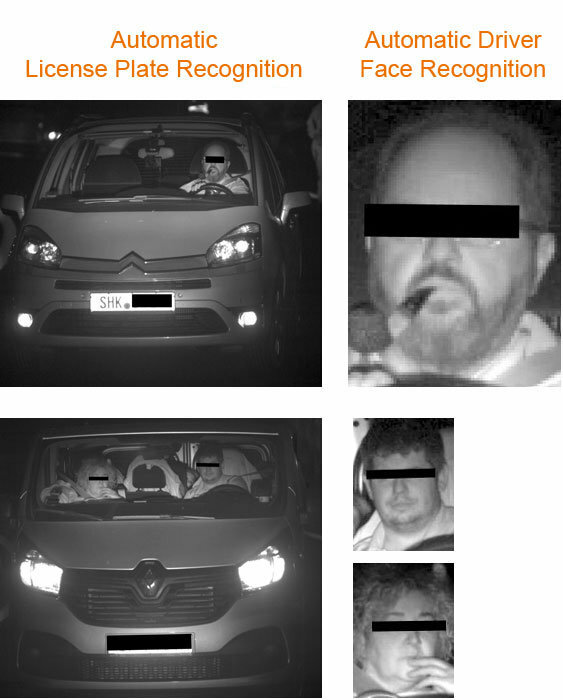 The use of special technology is required in order to capture the faces of people in vehicles in such a qualitative way that biometric facial profiles can be created and compared with stored profile data. In cooperation with OptoPrecision GmbH, artec technologies AG has developed such a special system. 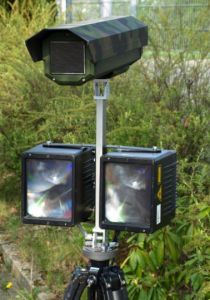 It employs a combination of a NIR sensitive CMOS video camera with narrow bandwidth interference filter, Eye-save powerful laser-based illuminators, process electronics with image processing, monitoring & recording system and an evaluation system with integrated face and license plate recognition software. Design made for 24h daylight- independent operation. If the system finds a match, it triggers audio-visual warnings with the vehicle being displayed on a monitor along with its car registration number, faces of passengers and stored comparative data. The video recorder records all data in real time, so that the recordings can be analyzed afterwards. Monitoring, alerting and evaluation functions. Mobile system consisting of NIR 4.2MP video camera in weatherproof housing, IR laser illuminators, hybrid cable and remote processor, monitoring and evaluation unit. Yes, I have read the data protection statement and agree that the data I have provided may be collected and stored electronically. My data will only be used strictly for the purpose of processing and responding to my request. By sending the contact form I agree to the processing.